Handcrafted Norwegian ciders come out on top in international championships and are created with a rock’n roll attitude. Taste the golden trends and traditions at fruit farms in the fjords and the valleys, or in some of the world’s best bars. Each May, tens of thousands of apple trees bloom in the beautiful southwestern Sognefjord and Hardangerfjord area. 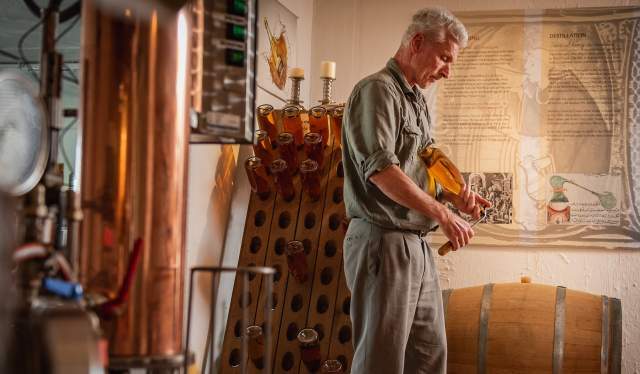 In the autumn, “the world’s best apples”, according to one of the world’s leading champagne experts, Richard Juhlin, are harvested by hand, and turned into world-class ciders. In fact, in 2019, Norway took home two gold and six silver medals from The CiderWorld Awards. The reason? “We have an almost anarchistic, slightly rock’n roll-like approach to fruit cultivation”, Åge Eitungjerde says. He runs Balholm, the award-winning company that makes handcrafted cider, along with his wife, Eli-Grethe. It is located in the village of Balestrand by Norway’s largest fjord, the Sognefjord. Several farmers in this area began with organic cultivation in the 1980s. For the numerous small fruit farms in the steep terrain, fresh thinking, diversity, and the ability to adapt has been crucial for survival. Now, people dare to compare Norwegian cider to the drink of all drinks: champagne. “The reflections from the fjord increase the amount of light in our steep slopes. The fjord also has a cooling effect on hot summer days, while the warmth of the Gulf Stream provides mild winters and mid-seasonal temperatures, even if we are located around the same latitude as Alaska and Siberia”, Åge says. The family’s establishment, Ciderhuset (The Cider House), is labelled as an Economusée, meaning you can learn about the roots of cider production, participate in cider tasting, courses, and taste local food, perfectly paired with the liquid gold. In Norway, apples used for cider are as diverse as grapes in France. Among the most common varieties are Aroma, Summered, Discovery, and Gravenstein, but farms might cultivate dozens of others species, as well as fruit from trees of French and English origins. Norwegian ciders took two Gold and six Silver at the 2019 CiderWorld Awards in Germany. Egge gård got two gold and three silver, Ulvik Frukt & Cideri two silver, and Balholm one silver. National, annual competitions, like during the Hardanger Cider Festival, have contributed to the general rise in ambitions and quality. Hanen (The farm produce organisation) and Norsk Eplefest also organise a yearly cider competition. More and more cider handcrafters offer cider tasting. Ciderhuset in Balestand is the place for advanced cider experiences in the Sognefjord area. The Cider Route in Ulvik I Hardanger includes three cider producers. The Hardanger Cider festival takes place every October in Øystese. 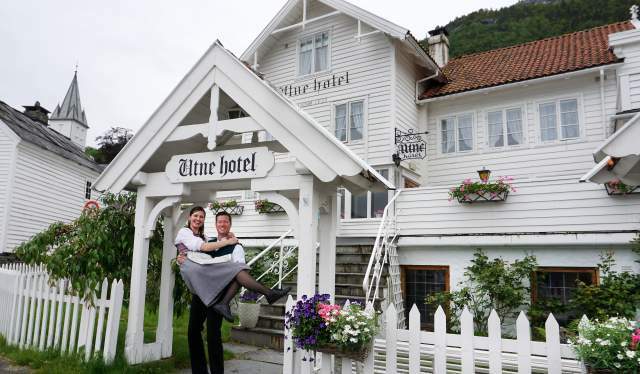 Utne Hotell in Hardanger is known as “The Cider Hotel”. The traditions of Norwegian cider probably goes back to the Viking age. Production experienced a peak in the late 19h century before being abruptly halted in the 1920s by prohibition. In 2016 producers of cider were permitted to sell cider with alcoholic content above 4,7 % on their farms. In 2019, cider was the fastest-growing product category at Vinmonopolet (The Norwegian Wine Monopoly). Quality check at Ciderhuset Balholm. Cider tasting at Ulvik Frukt & Cideri. But, you have to go a bit further south, to the Hardangerfjord, to find the country’s real epicentre of handcrafted cider production. Since 2011, the branding “Hardanger cider” is a geographically protected denomination in the same way as ‘Champagne’. The different kinds of apples of the fjords are as diverse as the French grapes. Now, more than 50 fruit farmers are members of the cider guild of Hardanger. “The unique combination of sweetness and acidity in the same fruit adds up to an explosion of flavours, and a perfectly balanced cider”, Joar Aga says, adding that the terroir continually benefits from the nourishing minerals flowing down from the surrounding mountains. The young cider craftsman has turned the traditional family farm into an award-winning cider company, and, in October 2018, Aga Sideri was the gold medallist of the Hardanger Cider Festival. Looking slightly like a modern-day Viking, Joar takes a big bite of a bright and fresh apple, looking out on the Instagram-candy Sørfjorden, the southern branch of the Hardangerfjord. Aga farm is located barely 50 metres from Agatunet, Norway’s oldest cluster of wooden houses with roots all the way back to the Viking age. Thirsty Vikings made their brew, called Bjor, of apples and honey. In fact, archaeologists found 54 apples when excavating the Oseberg Viking ship in Vestfold. Later, in the 13th century, monks who immigrated from England taught fjord farmers to plant apple trees and kick-started fruit cultivation in the region. 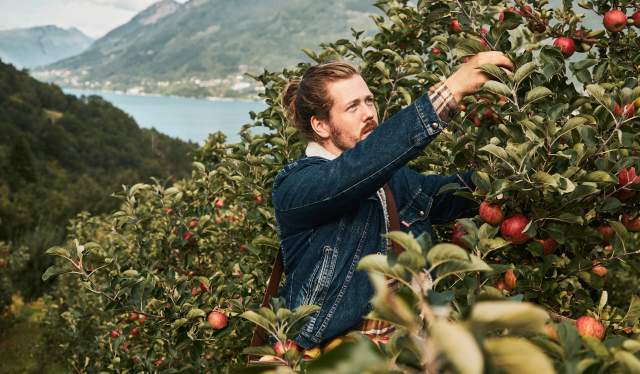 In the Hardangerfjord area, you can also enjoy the incredibly beautiful Fruit and Cider Route (Frukt- og Siderruta), for cider tasting, local food, farm visits and cool activities. For those in a festive mood, the Hardanger Fruit & Cider Festival (Frukt & Siderfestivalen) in Øystese takes places in October every year. Another unique experience is the daily cider tasting at 6 PM in the wooden Utne Hotel, which will celebrate 300 years in 2022, organised by hotel host Bente Raaen Widding and her husband, Kjetil. “Hardanger has a cider for every taste. Just the other day, I got a guest to taste eight different ciders. I never give up until I find the perfect match!” Bente states. Bente R. and Kjetil Widding, Utne hotel. Year by year, the number of high-quality cider producers is fast-growing, and so is the diversity of new flavours. “The Norwegian cider producers measure up with the best international beverage producers. The Norwegian climate, with high variation in temperatures between day and night, preserves the freshness of the fruits, and provides a long growth process, developing several layers of fragrance and flavour”, says Ingvild Tennfjord, an award-winning Norwegian wine journalist and author. Ingvild’s enthusiasm is supported by Bernt Bucher Johannesen, the director of Hanen, a guide to quality experiences in rural Norway. “Norwegian cider has definitely become part of ‘Scandi cool. If you go to the best bars in Oslo and ask for a special cider, the bartender will most likely be able to tell you about the origin, the farm and the soil,” he says. The bar in Oslo is ranked as number 19 of the 50 best bars in the world, and, in 2015, Himkok started Norway’s first cider bar in its backyard, mostly offering imported labels. “Now, we mostly serve Norwegian cider. The quality can be as perfect as the best champagne!” Odd says. And reveals that some customers come to drink cider and smoke cigars in the backyard under the open sky. “That is such a great combo!” he emphasises. Thirsty foodies should also try the Norwegian “Eplemost” (pressed apples). It is the excellent non-alcoholic alternative to cider, traditionally a sort of a national drink in Norway for both special occasions and everyday pleasure. Eplemost also comes in an impressive variety of flavours that can be paired with all kinds of food. Handcrafters of cider and eplemost welcome thirsty guests, not just in the Hardangerfjord and Sognefjord area, but also in several rural areas of the Southeastern part of the country, such as Telemark, Buskerud, Oppland and Vestfold. Egge Gård, in the Lier area, near the city of Drammen and only half an hour from Oslo, received no less than two gold- and several silver medals at the 2019 Cider World Awards. The farm’s shop? It’s a charming storehouse (“stabbur”) from the 1600s, full of new flavours and old history. Cider and eplemost tasting is simply a new and exciting way to experience the most beautiful parts of Norway. From hipster meeting places in Oslo and local microbreweries in smaller communities, to sports bars, traditional British and Irish pubs, and karaoke bars – Norwegian watering holes offer a great variety. Not long ago, most Norwegians drank whatever lager was on tap. Now, hundreds of new breweries are popping up, gaining international attention for their delicious craft beers.